Land Rover unveiled the 2013 Freelander 2 to select media at the cusp of the Canadian winter in Montreal. The icy conditions with temperatures hovering around the -8 degrees C mark, accompanied by icy rain only served to show off the abilities of the Freelander, widely regarded as the most off-road capable of the compact premium SUVs, the same segment as the Audi Q5 and the BMW X3. For the new model year, the changes are, on the face of it, modest. The powertrains continue more or less unchanged with the TD4 and SD4 2.2-litre four-cylinder diesels both making 420Nm of peak torque at 1750rpm. The power outputs are the differentiating factor, with 150 (at 4000rpm) and 190PS (at 3500rpm) respectively. We drove the Aisin 6-speed automatic-equipped cars. 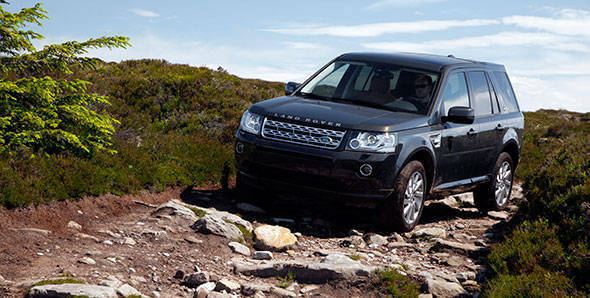 Driving on the highways and state roads, it reinforced that the Freelander is very similar to nature to the car we know. It's a competent highway cruiser that rides a bit on the stiff side of plush and it holds highway speeds comfortably though it never comes across as outstandingly powerful or, on the flip side, sluggish. Our automatic-equipped test car showcased quite neatly a smooth, unobtrusive transmission, though the conditions meant that the driving was perpetually done in the Sand/Snow mode which brings in the very sensitive (and ultimately super helpful) traction and vehicle stability control systems. In this mode, any slip at the tyres is countered swiftly and effectively, though it does make the car feel a bit slow to react - which was more the lack of traction than gumption. The few times we switched to mud or sand modes, the engine felt a lot more enthusiastic, allowing greater slip and more mischief before the inevitable gentle chiding. But ultimately, the conditions were way too difficult for us to allow the powertrain to really show off its full capabilities. The highlight, in the process, was a never-ending forest trail that featured deep ruts, mud, snow, steep uphill and downhill sections, and in places sections that tested the wheel articulation as well as traction management systems to the maximum. All of which the Freelander made look devastatingly easy, as expected. If there was ever any doubt as to the abilities of the Freelander, the frozen over off-roading quickly cleared that up. So the big changes for 2013, then, are mostly cosmetic. The exterior looks a lot sharper and smarter with the updated grille and new head and tail lamps all looking more Range Rover like, making the Freelander feel more upmarket, a welcome update. On the interior, the changes are even more pronounced and there is more equipment, a lot of Evoque inspiration and the material selections and design all point the Freelander towards a more premium feel. These changes should help the Freelander attract more customers. Land Rover also revealed that the move was planned to capitalize on the upward trend in Freelander sales that seems to arise from interest in the Evoque, which often translates into Freelander sales for a range of customers. The Freelander, as you know, is assembled in Pune already and the new version is expected to hit the market in March 2013. We expect the addition of one or more trim variants to the product mix but we also anticipate a slight rise in the price of the Freelander when the new one arrives. Land Rover did not confirm this, but the eD4 two-wheel drive also makes a lot of sense for India as it will offer lower priced and lighter alternatives to the TD4 and SD4 models across the trim range, and also create a lower base model price point. The eD4 is exactly the same car but loses 75kg via the removal of the four-wheel drive apparatus and is a 6-speed manual which brings economy and emissions advantages.